We've long argued that data and expertise has to be releavant on the scales that people live there lives. Often that means using data to explain what's happening locally, in a person's neighbourhood or ward, rather than in their city, region, or country. So in early 2016 we started experimenting with hexmaps, a way to show data on a local level in a simpler way than maps. We've since published hundreds of these maps, a standard for sharing them, and a guide to building them. 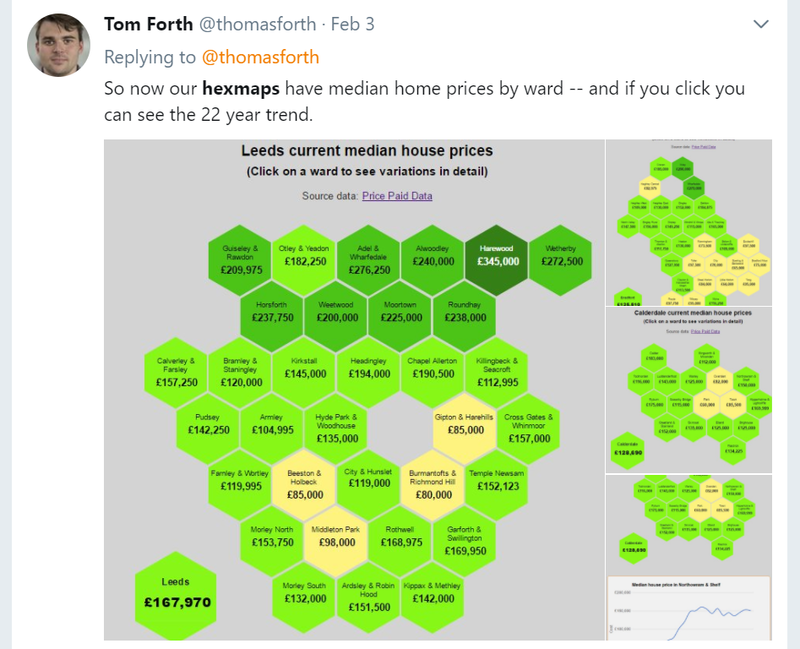 One of our most popular hexmaps was one showing house prices by ward in Leeds. Soon after sharing our work, people across the UK were asking us for the maps and analysis where they lived. Today we're talking a step closer to doing that. Working with BBC Leeds and the BBC's data unit we've created the data that powers their look at the very large regional variations in house prices across England and Wales. We are only able to do this for England and Wales because only The Land Registry make their prices paid dataset open. All of our code is open source and all of our data sources are listed. Look at the pricesbyward project on GitHub which is written in C# (WPF, Windows). There are no hexmaps yet, and no data on that site — we're giving the BBC a headstart — but there will be soon. A final note to our eager-eyed readers. The ONS do similar calculations, released as HPSSA Dataset 37. So why didn't we just use their data? The truth is that we started our project months before The ONS released this dataset, and we only became aware of their work after ours was finished. We have since compared our two methods, and to our great reflief, we get very similar results. Without seeing The ONS' code, we can't explain the small differences that remain. Our code is already being used for other projects, producing outputs that The ONS do not and never will. We firmly believe that open code and open algorithms are just as important as open data, so our duplication of effort was not wasted. And it is a reminder for us that we get much more done when we work in the open, but that the media doesn't work like that yet.